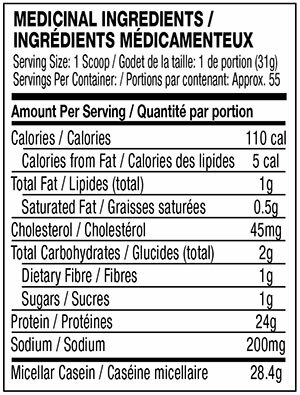 Non-medicinal Ingredients: Cocoa (Processed With Alkali), Natural And Artificial Flavours, Salt (Sodium Chloride), Soy Lecithin, Gum Blend (Cellulose Gum, Xanthan Gum, Carrageenan), Silicon Dioxide, Acesulfame-Potassium, Sucralose. Contains Milk And Soy Ingredients. Processed In A Facility That Also Processes Egg, Fish, Tree Nut And Wheat Ingredients. 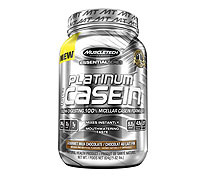 Recommended Use or Purpose: Assists in building lean muscle mass when used in combination with regular weight and/or resistance training and a healthy, balanced diet. Source of amino acids involved in muscle protein synthesis. Source of protein to help build and repair body tissues. Recommended Dose (Adults): Mix 1 serving (1 scoop) with 300mL cold water or skim milk 1 to 3 times daily. Do not consume more than 3 servings daily. Ideal use is at night time and between major meals. Read the entire label before use and follow directions provided. Suggested Use: Consume approximately 1 gram of protein per pound of body weight through a combination of high protein foods and protein supplements. For the best results consume your daily protein allotment over several small meals spread evenly throughout the day. RISK INFORMATION: Not intended for use by persons under 18. Consult a health care practitioner before use if you are pregnant or nursing or have liver or kidney disease. Consult a health care practitioner before starting a diet or exercise program. Ensure to adequately hydrate before, during, and after exercise.